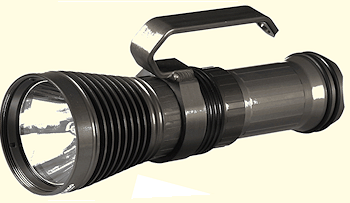 Category: Flashlights & Searchlights for Sale. Tag: Polarion. 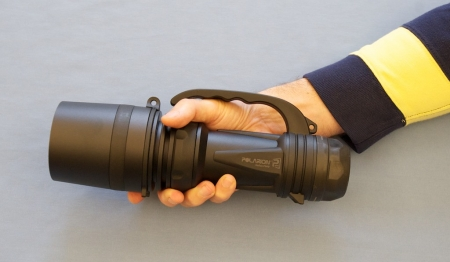 Law enforcement, the Coast Guard, search and rescue operators can put this light to good use and so can you. The low Kelvin temperature of the light is far more penetrating than higher K flashlights that have greater lumen output ratings. There is no need to make the beam spot or flood variable, you get both at the same time. Few lights give you such a good combination of strong spot and useful spill in a lightweight ergonomic package. 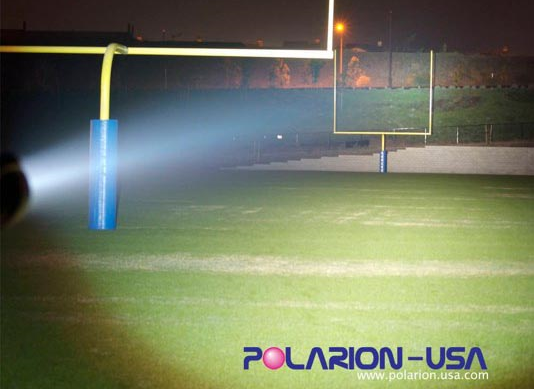 Compared to Polarion HID searchlights, no other lights give you the exact same features as rapid battery replacement in the field, fast recharge, extreme weather durability and huge amounts of focused and dispersed light in such small lightweight package. The Polarion PH40’s ergonomic design was specifically developed to meet the mission requirements of Law Enforcement and Military personnel in the field. 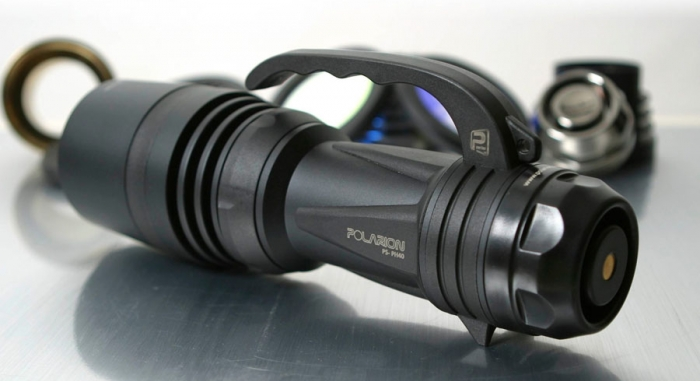 The Polarion PH40 draws it namesake from the power and intensity of the sun. This 40-watt powerhouse features a High Intensity Discharge (HID) arc lamp emits an incredible level of blinding white light ~ 4,200 lamp lumens. The PH40 Helios is a high-quality tool for professionals who need massive, clean, light output in a truly portable package. 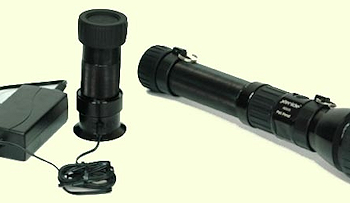 Pound for pound this is one of the most powerful and streamlined HID searchlights in its class. This high-powered HID searchlight is not burdened with traditional oversized ballasts. Polarion has developed an industry leading, streamlined ballast that gives this light its smaller overall footprint and lighter weight. Approx 12″ in length and just above 4 lbs. The proprietary electronics, and Lithium-Ion rechargeable battery are housed in a CNC machined aerospace aluminum body with a Mil-Spec Type III hard anodized coating. You will appreciate the elegance of the ON/OFF switching. A smooth rotary dial located just behind the flashlight’s bezel assembly. One distinct click in either direction will either turn the light ON or OFF. You will note the battery status indicator revealed through the translucent tail cap. Every time the Helios is initially switched ON, the LED’s on the battery will stay illuminated for 5 sec’s to let you know how much power is left in the battery. 5 Green LED’s means 100%, 4 means 80% and so on. No need to worry about memory or over-charging your lithium-ion rechargeable battery as the battery itself has integragted intelligence and will regulate the charging cycle perfectly. The beam is a fixed focus from the factory and tuned to provide an excellent combination of “throw” and “spread” that is ideal for searching. You can expect extreme reliability as HID lamps are not easily subject to breakage/failure as a result of mechanical shock and vibration. HID lamps are energy efficient and have no filaments, therefore you can expect 2,500+ hours plus from the lamp. Control and Evaluate large Areas in Low Light Situations. Standard Package consists of: (1) Searchlight, (1) Lithium-Ion Rechargeable battery with integrated charging intelligence, (1) D/C Wall Charger (120/220 volt compatibility), (1) Factory Carrying Strap, all housed in ruggedized, watertight carrying case. $2,195.00 Call for shipping and payment options. All sales are Final.